Kitchen Countertops Quartz Countertops How Sanitary Is My Quartz Countertop? The countertop has become one of the essential parts of any modern kitchen and it’s almost impossible to think your kitchen without a multifunctional countertop. The countertop is the main location where all your cooking works take place – cutting, grinding and chopping, they all happen on this particular surface and this is the main reason why you must go for a solid platform such as a quartz countertop. Quartz countertops come with enhanced scratch resistance power and are available in a wide range of finishes. For instance, you may go for a glossy finish that will provide an extra shine to your worktop or for a honed finish that provides a matte effect to your quartz countertop. Regardless of your final choice, quartz countertops are likely to fall right into the desirable category of modern materials that are to be used when planning to renovate and redesign your kitchen space. For instance, color variety is one of the best features provided by quartz countertops. You can choose from vivid colors such as greens, blues or reds or you can go for a lighter shade such as grey. 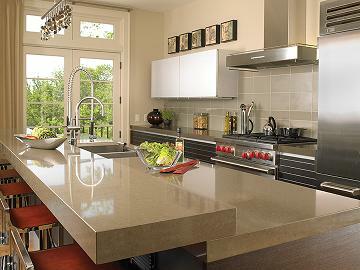 But the main reason why homeowners are so fond of quartz countertops is the fact that they are extremely hygienic. Cleaning this countertop is very easy and all you will need is a damp cloth and a small quantity of quality non-bleach household cleaner in order to remove any spills or excessive stains. Keeping your quartz countertop clean is easy as this surface is to be regarded as a maintenance free material. So, it is almost impossible to stain your quartz countertop. For instance, any other kitchen countertop is likely to have at least a couple of places for excessive stains to settle into, whether they are tiny cracks or tiny pores. Also, other kitchen countertops have many places for your food to get right into thus creating a permanent stain on the surface. When it comes to quartz countertops, their pores are extremely tight and small and this is the main reason why is very rare for any spill or stain that has been cleaned up as soon as possible to soak right into these tiny pores and stain your quartz countertop in a permanent way. These tight pores can also keep viruses and bacteria out of your quartz countertop because they deny the necessary place for bacteria to hide in. So, your quartz countertop is going to look clean and stay clean as well.